Made this for someone who inspires me all the time, both in card making and otherwise. This may be showing up in your mail box! 1. The set that came with the Simon Says Stamp August card kit, Ice Cream Dreams, has this little circle with the heart. 2. Stamped a bunch of times with different shades of pink and orange and punched out a pile. 3. Moved them around until I was happy with the color placement. Added an Altenew sentiment. 5. Took a scrap of black card stock and shaved a sliver with my paper trimmer. Was going for the "one heart connected to another" -- may be an overreach here! HA. MOOD WHEN DONE = Inspired! I love your card!!! Perfect design. I had to laugh out loud when I read..."This is where things usually go wrong." Yep. I ruined two cards last weekend when I carried them one step too far. But you totally knocked it out of the park with the sliver of black! I get the connection idea and it works perfectly! I love this! You are a genius! Gorgeous - love that some are popped up and some aren't! Great texture, dimension and still beautifully clean! You are on a roll! Love this card and the previous one as well. The color combination is delightful. The black sliver is perfect! The things you can do with such a tiny stamp! Amazing! I love the sliver of black. Very creative idea to use cardstock for it. I really thought it was string at first. I love the sliver of black cardstock. I know wound up thread is popular right now but it always looks like a messy birdnest to me! The black cardstock is pure genius! Oh, this is fabulous in every way. 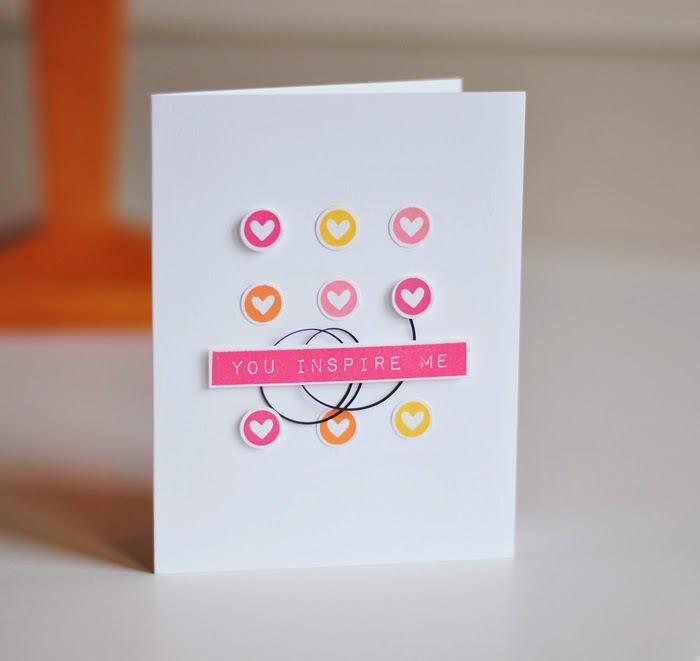 Love the heart circles, your sliver of black and that fabulous pink and white sentiment. Another thumbs up for that little shaved-off strip of black - it looks just great!